Von Willebrand Factor isolated from human plasma. Our Abpromise guarantee covers the use of ab778 in the following tested applications. IHC-P 1/15 - 1/30. Perform enzymatic antigen retrieval before commencing with IHC staining protocol. IHC-Fr 1/15 - 1/30. ABC method. We suggest an incubation period of 60 minutes at room temperature. Formalin fixed paraffin embedded human tonsil stained with Von Willebrand Factor using ABC and AEC chromogen. I've used your mouse monoclonal von willebrand Factor antibody (ab778)for IHC in my experiments. The data will be published. The edditors asked us to show the specificity of this antibody. Your data sheet showed 3 references. I checked them and found no one exactely used this antibody for IHC. Could you tell me where the image (a good staining)in the data sheet was cited from? Do you have the antigen for this antibody? Or could you tell me what company has this antigen? I will buy the antigen of this antobody to run the preabsorption experiment. Based on the data Factor VIII reacts specifically with the endothelial cells of normal, reactive, and neoplastic blood and lymphatic vessels and shows finely granular cytoplasmic staining. It also reacts with endocardium, platelets, and megakaryocytes. Please let me know if this information is sufficient. I have emailed the lab to check regarding the specificity testing, and I'll let you know what I find out. 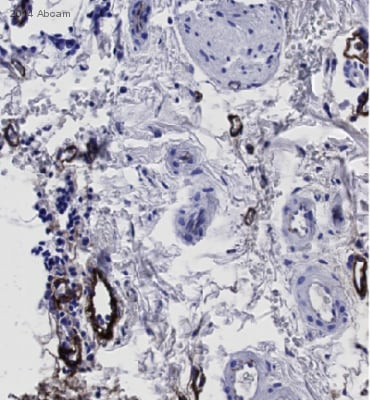 The IHC image on the datasheet is from the lab. The immunogen used to raise the antibody was Von Willebrand Factor isolated from human plasma. We carry vWF protein (ab88533 and ab88555) that can be used for blocking, although we have not tried that application with these 2 proteins. You can use our testing discount program to try either protein in a blocking experiment.